Birches offers a rigorous interdisciplinary education emphasizing student-driven, project-based thematic curricular units. We promote the meaningful integration of science, technology, engineering and mathematics with art and design, giving the arts an essential and generative place in the curriculum. Students collaborate on projects that foster flexible thinking, problem solving, and the integration of individual and group efforts. We support young students in their joyful exploration of the natural world by providing rich and diverse lessons highlighting the interconnectivity of academic subjects. Curricular units are informed by nature and community. We emphasize the qualities that enable discovery: careful observation, creativity, and methods of experimental design. We provide opportunities for hands-on research and we enhance learning by introducing students to guests who are career specialists in a broad range of disciplines. In the spring of 2015, our study of Roman architecture led to the creation of our own, to-scale (modern) city, designed and constructed by seven multi-age groups of 2nd, 3rd, and 4th Graders. One of the most important aspects of the city-building project was collaborating effectively in teams. Learning the value, strategies, and joy of team collaboration is an essential part of the Birches social/emotional curriculum. What Does AN INTERDISCIPLINARY Birches Curriculum Look Like? Raising silk moths from eggs, illustrating, measuring, and tracking their life-cycle. Creating student life timelines and comparing them with silk moth timelines. Learning about silk fabric production and history from Jenn Swope, a textile curator at the Museum of Fine Arts, Boston. Learning about the 21st-century technological reinvention of silk (through reverse engineering) from Tufts Professor Fiorenzo Omenetto. Experiencing Arabic rhythms with Vlada Tomova’s Bulgarian Voices Trio. Studying the music of the Silk Road. Silk Road Ensemble members Sandeep Das and Mike Block gave a riveting family concert/workshop in November 2014. Making pickles using Silk Road spices. Crafting ceramic tomb figurines similar to ones found in Han Chinese tombs. Dyeing silk scarves with natural plant dyes. 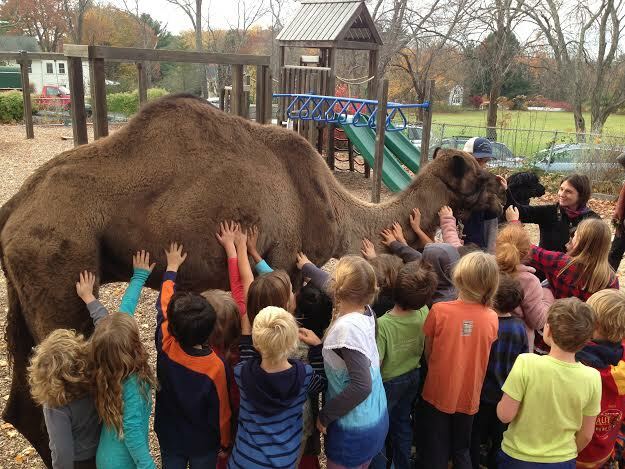 Studying the camel and enjoying a thrilling visit from a real camel to the Birches playground. Reading fiction and nonfiction texts about the Silk Road. Writing our own Silk Road narratives. Learning about Chinese jade and Roman glass and their magical properties. Preparing (and eating) an authentic celebratory feast after teams of student caravans converged in Kashgar. Learning about archaeo-geophysical visualization from Time Team America archaeologist Meg Watters. Engaging in a staged archaeological dig and finding Silk Road-related objects. Mapping the Silk Road and engaging in a math congress focused on travel and the trading of goods along the Silk Road. Visiting the Chinese and Roman Galleries in the Museum of Fine Arts, Boston for an imaginary journey on the Silk Road. Studying and practicing alectryomancy (rooster divination, popular in ancient Rome), using young roosters hatched from eggs in the classroom. Creating Roman-inspired mosaic architectural decorations. Studying Roman architecture and engineering; creating arch and truss bridges. the Birches Silk Road in the Year One curriculum inspired the May-June 2016 issue of Dig into History, published by Cricket Media. LEARN MORE ON THE PUBLICATIONS PAGE OF OUR WEBSITE!